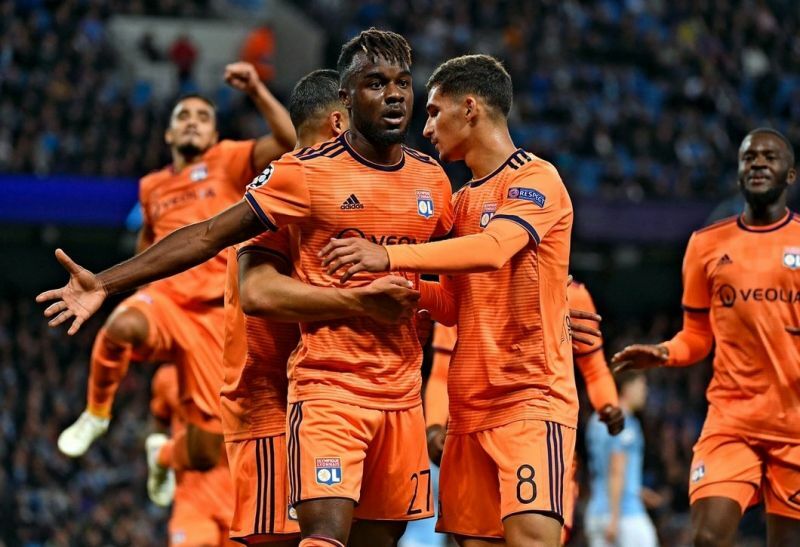 Pep Guardiola’s Manchester City were handed a stern reality check by Lyon in their opening Champions League game this season, with Lyon defeating the defending Premier League champions 2-1 this evening at the Etihad Stadium. Guardiola could only watch on from the stands as his side fell to defeat with the former Barcelona manager suspended after being sent off last April in City’s quarter-final second-leg defeat to Liverpool. Former Arsenal midfielder and current City assistant manger Mikel Arteta was the man to stand in for Guardiola on the touchline for the Citizen’s this evening. There were hints that Manchester City weren’t at the races early on in the matchup but things went from bad to worse when Maxwel Cornet scored in the 26th minute for the visitors. Cornet converted from a Nabil Fekir cross which should have been cleared by City’s Fabian Delph. In comedy fashion Delph completely missed the ball and Cornet was ready and waiting behind the stand-in left-back to fire into the back of the net. Check out Cornet’s opener here. City had a chance to equalise minutes later but Raheem Sterling was called offside for his part in the build up to to the goal. City would go on to rue their missed chances after another defensive error led to the side going into the half-time break trailing by two goals. Lyon star Nabil Fekir pressured Aymeric Laporte and after winning the ball from the City defender went on to score a stunning solo goal in the 43rd minute of the match. City players crowded the attacker but couldn’t stop the French international from firing into the back of the net. Bernardo Silva handed City a lifeline in the 67th minute of the match when he struck the ball into the bottom corner following an impressive low cross by substitute Leroy Sane. Caught Offside earlier reported fan’s frustrations at Guardiola’s decision to start Sane on the bench. If the winger was given the chance from the get go tonight’s result could well have been very different. Following the defeat Manchester City made history for all the wrong reasons. Ederson 6, Walker 5, Stones 5, Laporte 5, Delph 4, Gundogan 5, Fernandinho 4, David Silva 6, Bernardo Silva 6, Gabriel Jesus 5, Sterling 6. Day to forget: Fernandinho gave away the ball which led to Lyon’s first goal and didn’t seem to recover from this mistake as the game went on. Lopes 7, Mendy 7, Denayer 8, Marcelo 7, Rafael 6, Diop 7, Ndombele 8, Aouar 7, Fekir 8, Depay 7, Cornet 8. Maxwel Cornet – the striker showed great reactions to latch onto Delph’s mistake to score Lyon’s opener. The forward also done more than his fair share of defensive work to ensure Lyon came away with the victory. Jason Denayer – it was poetic that the former City academy graduate turned in a performance of the highest quality against his former club. Denayer was ‘undeniable’ in the air and battled hard for his side to win 50/50 duels which ensured that Lyon didn’t allow City to scavenge a result towards the end of the game. Hope this result wakes the team up. Couldn’t recognise City in that first half, lost too many balls in the middle, exactly what Pep complained about on Saturday. Really poor performance. Jesus’ doubters are back and who can blame them? Gundogan not offering much, Delph had a shocker and if anyone can explain Kyle Walker to me I’ll be amazed; I’ve said it for ages and I’ll keep saying it – weak link. City need to bounce back in their next Champions League game if they are to have any chance of topping Group F.